The large (giant) willow aphid, Tuberlolachnus salignus, is, in my opinion, one of the world’s greatest unsolved mysteries. 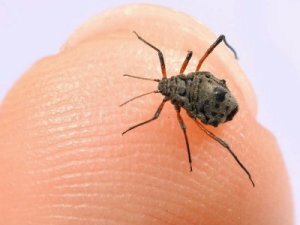 This aphid is sometimes regarded as being the largest aphid in the world. 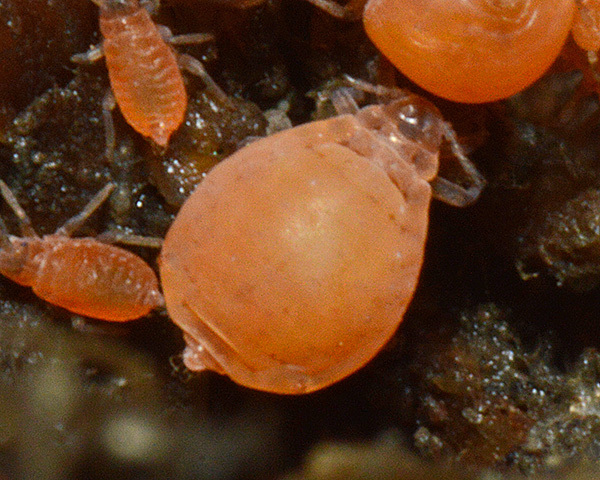 It can reach a length of 5 mm, can weigh up to 13 mg as an adult and the new-born nymphs weigh about 0.25 mg (Hargreaves & Llewellyn, 1978). You can get an idea of how big it is from the picture below. 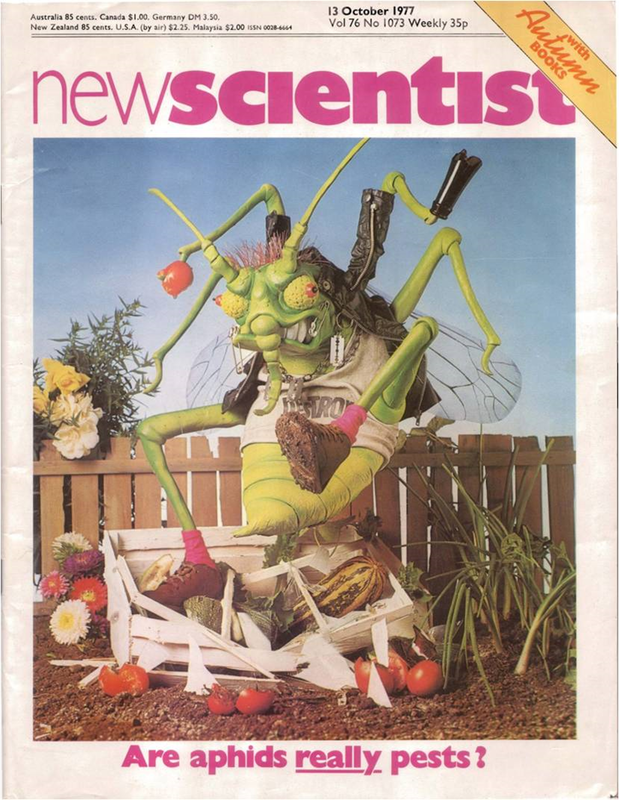 This is pretty big for an aphid, although not quite as big as one of my former PhD students (Tilly Collins) liked to pretend! 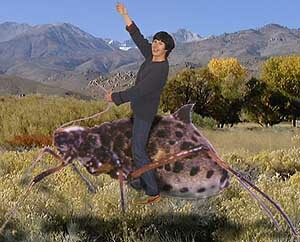 The picture below used to appear on her website and was the envy of a number of Texan entomologists. 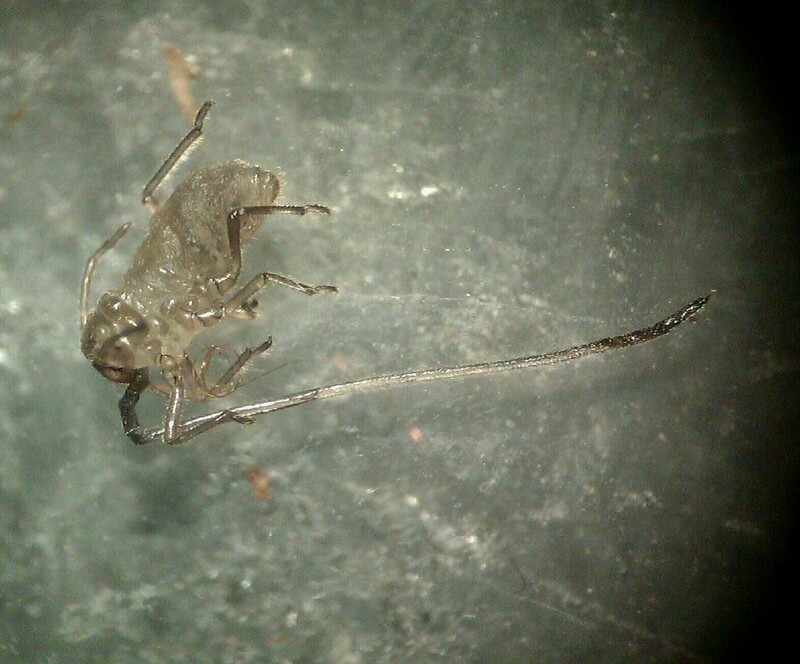 Tuberolachnus salignus, as you might expect, since it feeds through the bark and not on leaves, has rather a long set of stylets, up to 1.8 mm, more than a third of it’s body length (Mittler, 1957). This picture emphasises the first mystery: what is the function of the dorsal tubercle, which so closely resembles a rose thorn, or to me, a shark’s fin. Nobody knows. Is it defensive? Unlikely, since T. salignus being a willow feeder is stuffed full of nasty chemicals and very few predators seem to want, or be able to feed on it. They feed in large aggregations on the stems of their willow tree hosts and can have serious effects on tree growth (Collins et al., 2001). As the aphids produce a lot of honeydew, they are often ant-attended (Collins & Leather, 2002) and these also deter potential predators. 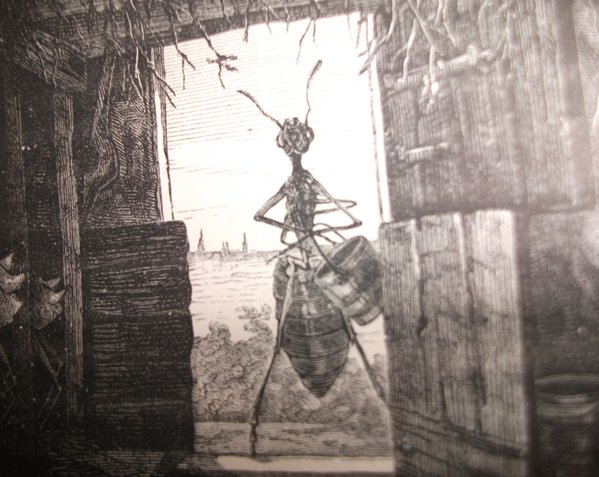 In fact the aphid colonies produce so much honeydew in the summer that they attract huge numbers of vespid wasps that are in search of energy-rich sugar sources at that time of year. 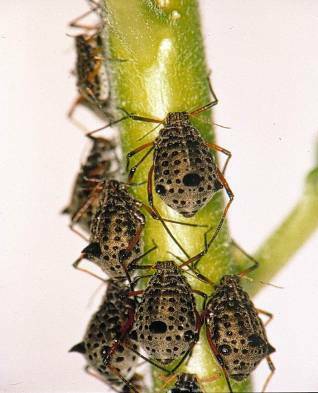 These too are likely to make potential predators and parasitoids think twice about approaching the aphids. The wasps also cause a problem for researchers and when Tilly was doing her PhD, she used to have to confine her fieldwork to those times of day when the wasps were not around. In addition, if you crush one of the aphids you will discover that it stains your fingers bright orange and that this stain will last several days if you don’t try too hard to wash it off. If you get this aphid ‘blood’ on your clothes they will be permanently marked and Tilly used to say that she ought to be paid an extra clothing allowance. Tuberolachnus salignus, is as far as we can tell, anholocyclic, no males have been recorded and no matter how hard people have tried to induce the formation of males and sexual females, they have not been successful. This is however, not the second mystery. The mystery is that every year, in about February, it does a disappearing act and for about four months its whereabouts remain a mystery (Collins et al., 2001). 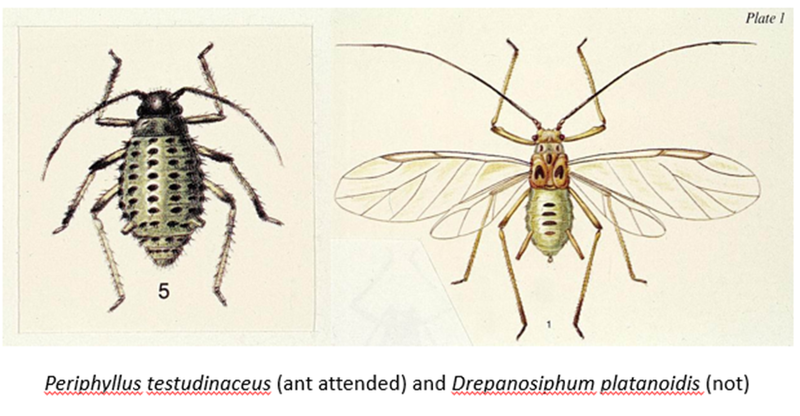 So we have an aphid that spends a substantial period of the year feeding on willow trees without leaves and then in the spring when most aphids are hatching from their eggs to take advantage of the spring flush, T. salignus disappears! Does it go underground? 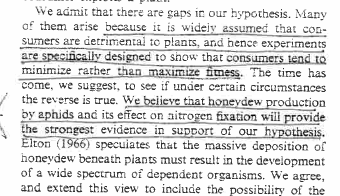 If so, what plant is it feeding on and why leave the willows when their sap is rising and soluble nitrogen is readily available? 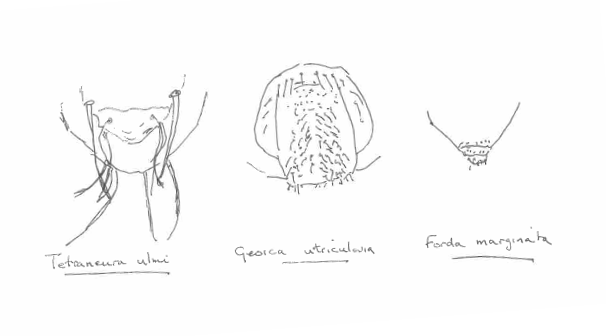 So here is a challenge for all entomological detectives out there. What is the function of the dorsal tubercle and where does T. salignus go for the spring break? Truly a remarkable aphid and two mysteries that I would dearly love to know the answers to and yet another reason why I love aphids so much. Collins, C. M., Rosado, R. G. & Leather, S. R. (2001). The impact of the aphids Tuberloachnus salignus and Pterocomma salicis on willow trees. 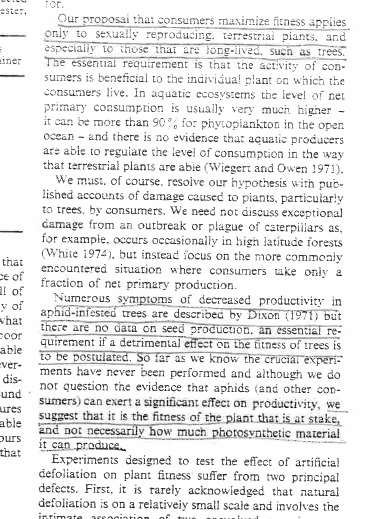 Annals of Applied Biology 138, 133-140 http://onlinelibrary.wiley.com/doi/10.1111/j.1744-7348.2001.tb00095.x/abstract.